Enter Fans Toys Grinder! 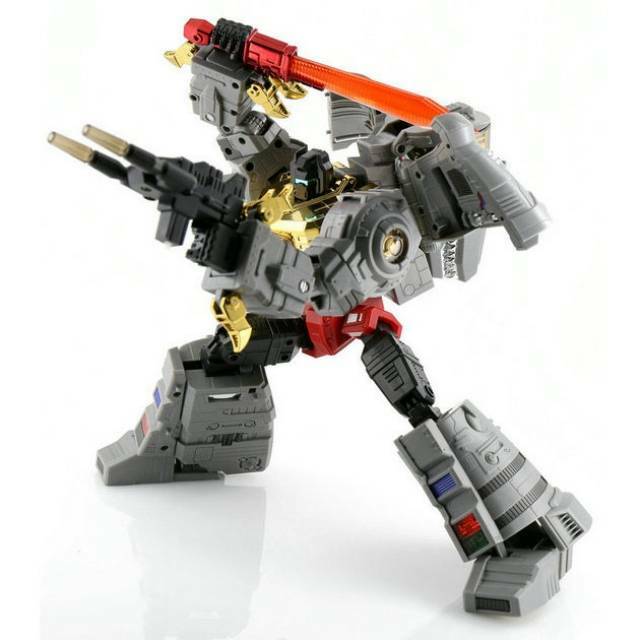 This MP scaled figure is fully transformable and stands 10"/25.4CM tall in robot mode. Comes ready for battle with weaponry as shown! What more can I say that reviewers like Emgo, Peaugh, and Optibotimus haven't already said. This is the one guys. 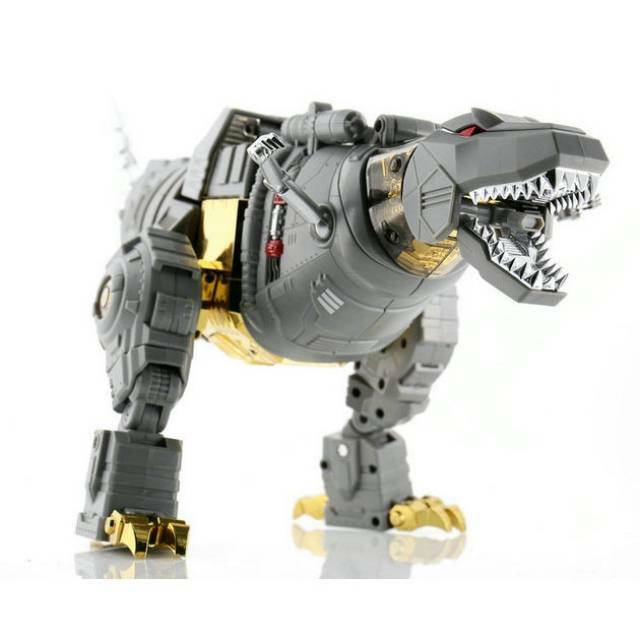 If you ever wanted a masterpiece Grimlock then look no further because it just won't get any better. I love how the legs are bulked out when cleverly concealing the tail and I love his gigantic presence in dino mode. My only complaint is that my current space is just too small now to house all my masterpiece bots. "ME GRINDER NOT BOZO ME KING!!!!!!!" 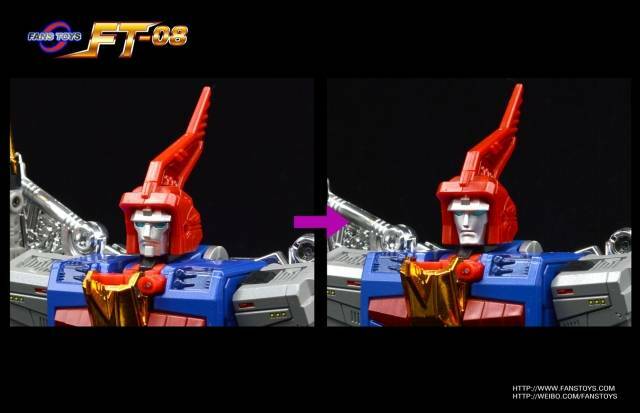 Fanstoys has done it again. Grinder (grimlock) is a true masterpiece. Yes his transformation is simple. but he transforms flawlessly. Both modes look awesome. Yes his waist is a little small. But he looks great next to the other dinos. 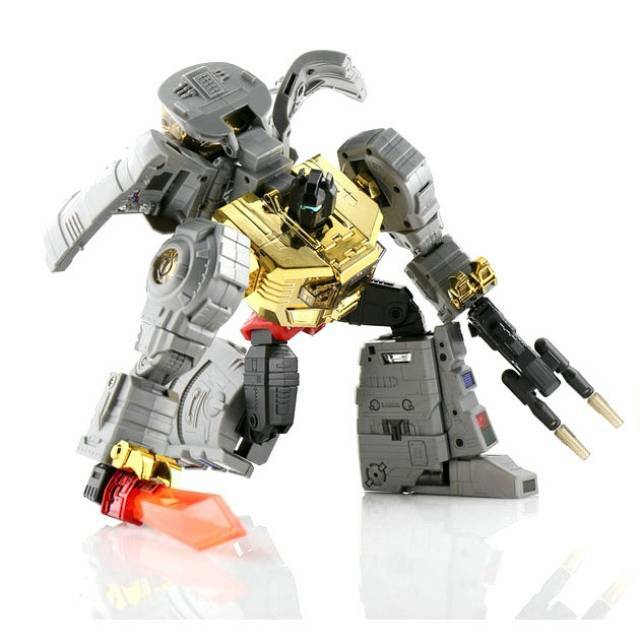 The extra parts for the other dinobots will only enhance the overall look of this line. 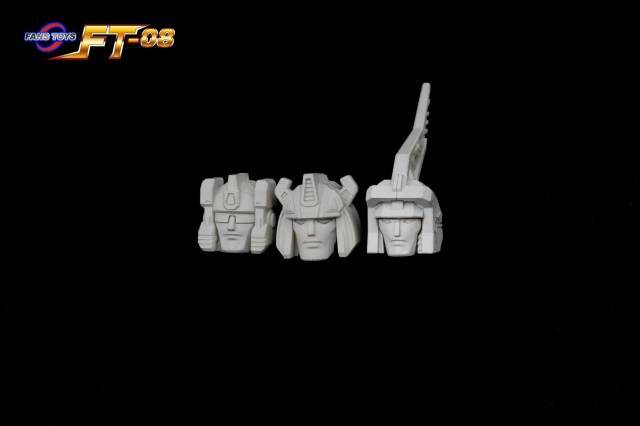 This is the kind of quality you expect from Fanstoys. Good diecast. Close to the G1 look. Don't get me wrong i like Takara's MP line. but this is how big their Grimlock should have been. 1000 bucks is not to much for this line. If I could afford to buy them again so i could have both modes on my shelf I would. i you can afford to buy him you should. YOU NOT BOZO YOU KING!!!!!!!!!! "THE KING IS HERE... THERE ARE NO COMPARISONS!" The caption say's it all... FansToys has completely out done themselves. The scale on this guy... AMAZING! The transformation simple! And the detail.... true homage to G1 Grimlock in everyway... EASILY THE CLEANEST AND BEST FIGURE (in my book) THEY EVER MADE! I have the Takara MP Grimlock and honestly this figure trumps him on every level. He has weight to him, like the rest of the DiBots, and the MP just feels flimsy in comparison. 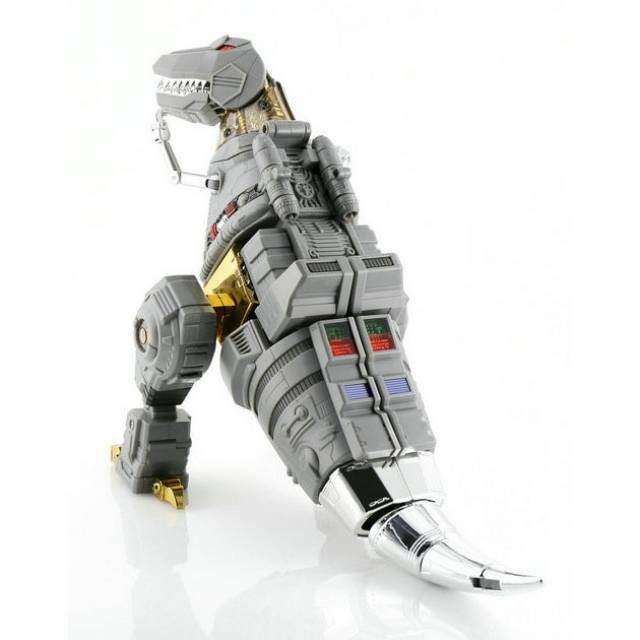 Even if Takara takes on some more Official MP Dinobots, I think they'll fall short of Fans Toys. This whole line is fantastic! Since I already had an MP-08 Grimlock, Grinder was the only Iron Dibot I wasn't sure I should get. Having him in hand, however, has completely turned me around. 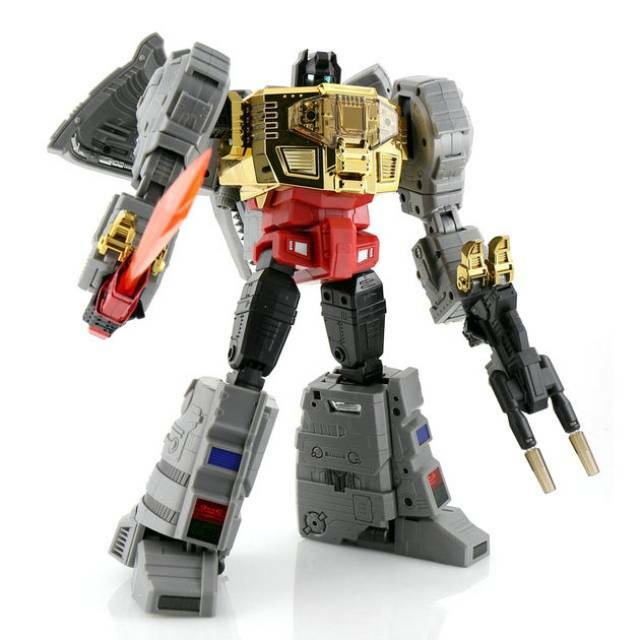 He's the perfect end-cap to an outstanding set of unofficial dinobots. 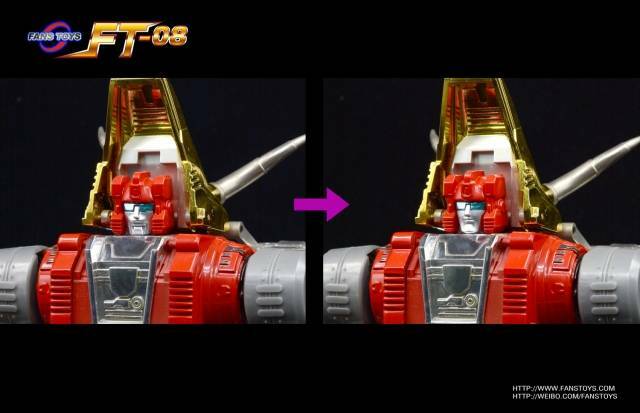 And can we just take a minute to acknowledge FansToys willingness to fix past mistakes? I wasn't bothered by the old faces, but now they're even better. I won't have to fear breaking Soar's shins anymore either. FansToys have proven yet again that a figure from them is money well spent. 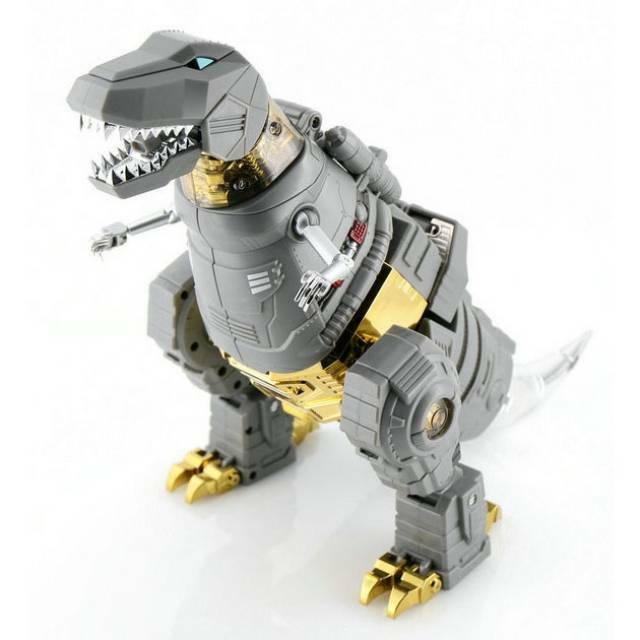 Ok, is he better than MP Grimlock? Dunno, I think MP Grimmers is a great figure, but Grinder dos have that Die-Cast edge and he's to scale with all the other FT dinos. Casting comparisons aside, as a figure he is superb. Again, step up in both finish and transformation design. 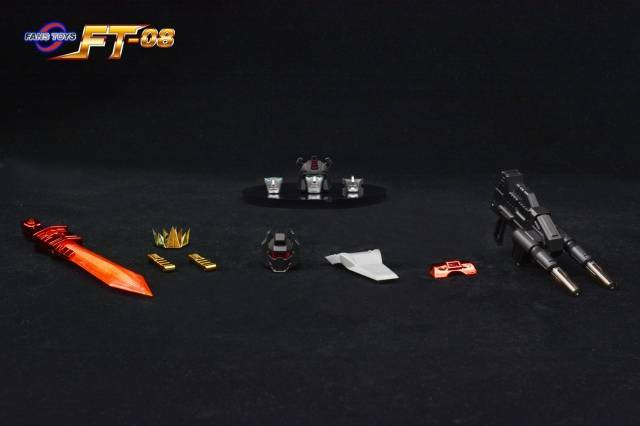 You get some weird extras on top of his blaster and sword, like an extra head for Scoria and some 'platform shoes' for MP Grimlock. Which I thought was kinda funny, a bit like Grinder's asking him to 'step up'! Anyway, I digress, Grinder is a superb final addition to the FT Dinos. I have both incarnations of the King and Grinder feels like he's as much a Masterpiece as the official Grimlock, but he's also his own figure; happily residing over his peers in the FT Dinobot line-up. I know a lot of people weren't as excited about this one since we have an official masterpiece already, but this is the one I was most excited about. I like the official one, but it is too small. I am not really into just over-sized KOs, so this solved it. He took cues from the official one and improved in several areas. And he has WEIGHT! I love it, just what I wanted for my collection. "haven't seen anything as good as this grimlock"
WAY BIGGER than expected WOW! probably same size as masterpiece oversized. BUT THE FIGURE IS AMAZING! HAVE to buy xtransbots ollie or "wheelie" when buying this guy. G1 accurate,posable but wish it came WITH LR66 BATTERIES! would have seen a light up gun and sword,but it is 10/10 abd comes with extra accessories for other Dinobots "if u have shelve space" lol. huge but not that heavy and very strong joints. "Glad Fanstoys did a reissue"
I missed out on Grinder during the first run, and was on the fence about getting him during the reissue, but I am so glad I bought him along with the G1 style head. He looks great on my self next to MP-10 in dino and bot modes. 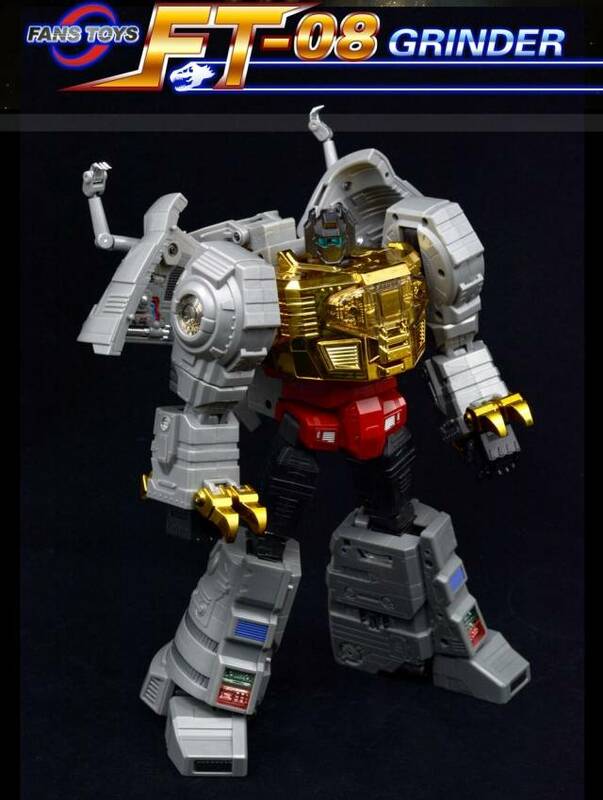 His proportions are right, and he has the general aesthetic of the animated G1 Grimlock. He is also very heavy and sturdy. He has a lot of detail, but much of it is hard to see because the gray blends it all together, and thus I chose to panel line him, which made a huge difference on an already great figure. Needed a Grimlock to size well with my MP10. Beautiful figure but came with the right Dino hand broken off and one of the tail pieces snapped. Not happy. 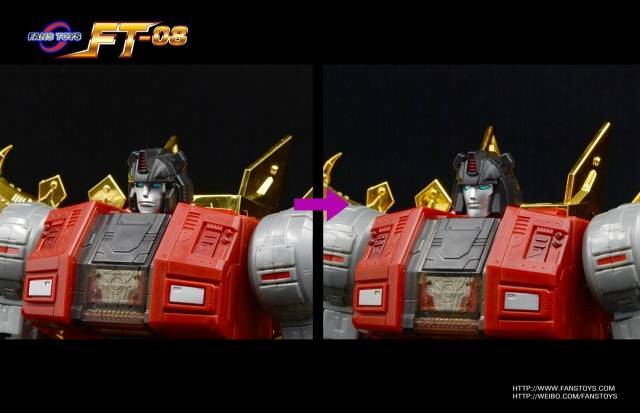 Fanstoys have outdone Takara on this one.Its is very well made with smooth transformations.